Every year I set myself work and personal goals and then I review how well I did at the end of the year. Here’s last year’s post. In this post I’ll review how well I did with 2013 goals, discuss extra cool stuff that happened, set 2014 goals, and review my big mistakes of the year. In summary though, this year has been pretty damn awesome. Probably the best year in at least 5 years. I’ve really enjoyed being back in my house in the UK after living in Canada for 4 years. It’s a great house in a lovely area and we’ve fixed and improved various things around the house, which feels good. Also my workspace is really good, just how I want it. 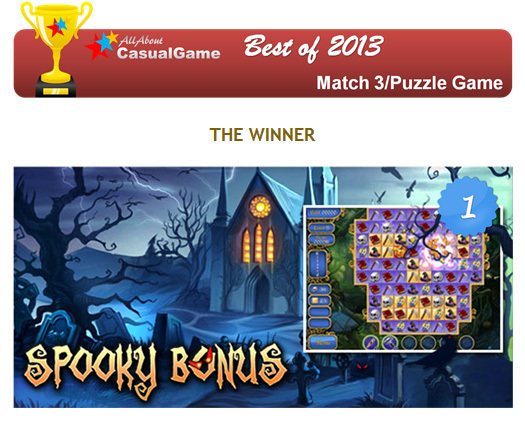 The main success of the year was Spooky Bonus, which turned out to be a much-needed hit game. I’ll do a proper postmortem on it in February or thereabouts. Also my family life has been very nice and things just seem to be going well for a change after a few difficult years. Success rate = 5 out of 7 = 71%. Much better than last year and two of those successes were pretty huge (3 and 8). Note that goal 7 was optional and thus not included in the calculation. 8 ) Loose some weight and boost my fitness to and beyond previous levels. FAILED: I did actually loose some weight for most of the year and got reasonably fit in the summer with lots of walking and cycling, but then I put all the weight back on this Christmas, sigh. Still, at least I didn’t get any fatter. Success rate = 5.5/8 = 69%. (note that part-successes are counted as 0.5) Not too bad. Overall I feel I had a good life/work balance this year. OK what other cool stuff did I do this year? – I managed to get Spooky Bonus on some major new portals and some smaller ones and then I got them to take my older games too, which will generate some nice extra revenue. – I made a couple of retail deals for German versions of my older games. Wasn’t big money but was nice. – I made some more UK indie developer friends and hung out with old friends. – I got a government grant from GamesLab South West (Creative England) for my next game. This is pretty damn awesome, but was hard work to get. – As well as lots of small home repairs/improvements we renovated a room in our house to make an office for my wife who is helping with my next game as a researcher/writer/administrator. – At the beginning of the year I made some digital artwork with a mouse, then bought a new tablet and made even better artwork. You can see it here. I surprised myself with what I was capable of and enjoyed it immensely. It was very time consuming though and fell to the wayside but I hope to pick it up again in 2014. – I got awarded 3rd Dan in Aikido for my many years as an instructor and running Bridport Aikido club. This was a proud moment for me. – I paid a lump sum off my mortgage early in the year. This felt amazing as I’ve never done it before. I’m going to keep things simple and specific this year to ensure more focus. 1) Ship Titan Attacks mobile in the 1st Quarter. 2) Ship Regency Solitaire in mid-summer. This is a new casual game that I’m working on with my wife. 3) Optional Goal: Ship another casual game before the end of the year. The reason this is optional is that it depends a lot on how well Regency Solitaire does and how the casual game market is doing. Also there’s a possibility that I might make an “indie” game instead and that might not get done until 2015. 4) Add some more levels to Techno Zombies. This was my December #onegameamonth game that I actually started in January. It’s not as complete as I’d like it to be, so I want to work on it some more. 5) Take part in at least one game jam. I love game jams and want to try out my improved Monkey X framework on another minigame. 6) Stretch Goal: Show over £125,000 ($200,000) gross income/revenue on my company’s books including grant money. Based on 2013 this should be achievable if everything goes to plan. 1) Make at least 6 new pieces of digital art. 2) Do another gig either on acoustic or electric guitar. 3) Make at least 3 pieces of electronica. 4) Go on a family holiday in the UK or Europe. 5) Play at least 20 indie games from my backlog. 6) Reduce my weight from 69Kg to 65Kg by end of June and don’t put it back on at Christmas. – Not shipping Titan Attacks mobile: This game really should have been done by now and it’s a bit embarrassing that I haven’t finished it yet. – Shipping casual mobile games: I shipped two casual mobile games this year: Spring Bonus and The Wonderful Wizard of Oz. Other people did the ports so it was just a case of me directing the developers, testing builds and dealing with publishers, which didn’t take that much time. However, it was distracting from my main work and in the scope of things they didn’t make that much money. 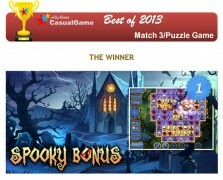 That’s why I didn’t make a mobile version of Spooky Bonus – I just wanted to focus on the PC/Mac versions instead, which proved to be a good decision. I don’t have any plans for further mobile games at this point. – Doing #onegameamonth: This is only a minor mistake from a work point of view, not from a personal point of view. Instead of doing #onegameamonth I probably could have shipped Titan Attacks mobile this year (maybe), and I could have spent more time on a commercial casual game instead. However, the total time spent on #onegameamonth wasn’t that much, probably no more than one month in total and it was hugely rewarding. – Emptying my company bank account: At the start of the year I had quite a lot of money in my company account and I knew that it was making me complacent. I decided to take it all out and pay off some of my mortgage, even though I had large debts on 0% credit cards from moving back from Canada. “Why would I do something so dumb?” you may ask. Well, unfortunately I get motivated by running out of cash and I knew that stick works better than carrot with me – I wish this wasn’t the case, but it is. However, paying off some of the mortgage means that in the long term I’ll pay *way* less interest and that money isn’t being wasted now on something else. The 0% credit cards aren’t a big deal, in fact when one deal expired I just transferred it to another card for a small fee. They are gradually getting paid down and if the bank wants to offer me practically free credit, then I’ll take it for cash flow purposes. What became a problem was that I didn’t earn any new money quickly enough and so we had to live off credit cards in the summer and hope that Spooky Bonus did well (which luckily it did – to be fair it was a gamble with good odds). Anyway, I seem to have found new motivation in just wanting to repeat the success of Spooky Bonus and so I don’t feel the need to use the stick any more. I’m trying out a new system of paying myself a regular salary instead of irregular dividends and if I need any credit, then I’ll try to get it through my company instead of personally (it’s way easier to get personal debt than a company loan by the way). And thus another year ends! It’s been a great year and I think 2014 is going to equally, if not more so, awesome! I wish you all both work and personal success in 2014. Please tell me how your year went in the comments. This entry was posted on Thursday, January 2nd, 2014 at 5:59 pm and is filed under Plans. You can follow any responses to this entry through the RSS 2.0 feed. Both comments and pings are currently closed.